Book Description: Seventeen-year-old Amy joins her parents as frozen cargo aboard the vast spaceship Godspeed and expects to awaken on a new planet, three hundred years in the future. Never could she have known that her frozen slumber would come to an end fifty years too soon and that she would be thrust into the brave new world of a spaceship that lives by its own rules. 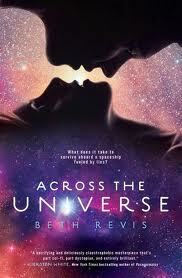 Review: Beth Revis’s Across the Universe weaves intrigue, science, mystery, and lies within the atmosphere of the Godspeed. Amy may be nonessential cargo, but she is a driving force of change in a place where the crazies are really sane and the normals are really crazy. Elder must decipher the lies and find the truth within and without. The beginning is horrifying, but then the reader learns piece by piece that the start is mild compared. A perfect society the Godspeed is not. The characters are relatable. The story is heart-wrenching. Even when the reader thinks everything is figured out, it’s not. Ms. Revis tells this raw tale of what could be. She clearly researched well. She encloses the reader within the story and doesn’t let them out, even at the end. I had a hard time putting it down until I finished it. Across the Universe is everything a novel should be. To use one of Ms. Revis’s words, it is “frexing” awesome. Beth's book has influenced me to write even more. I loved getting lost in her world, and I want to write a book that does the same for another reader as hers did for me. I can't wait until the next one! I really like Across the Universe, even though I figured out the mystery right away, she still wove a compelling tale. Sounds good. Maybe a little too scary for me! This is on my TBA list! Great review, Cherie! Bought this when it came out, but still haven't read it! The premise sounds so interesting. And I'll read anything involving spaceships.